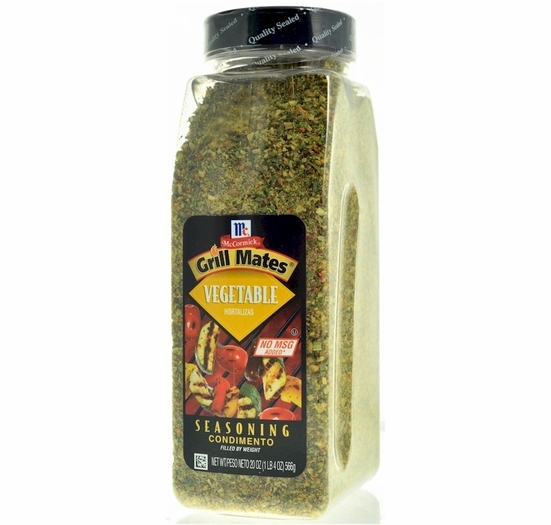 McCormick Grill Mates Vegetable Seasoning 20 oz. Home / Popular Brands / McCormick / McCormick Grill Mates Vegetable Seasoning 20 oz. Home / Pantry Items / Spices & Seasonings / Spice & Seasoning Brands / McCormick / McCormick Grill Mates Vegetable Seasoning 20 oz. Home / New England Classics / Spices & Seasonings / Spice & Seasoning Brands / McCormick / McCormick Grill Mates Vegetable Seasoning 20 oz. Home / Foods of New England / Spices & Seasonings / Spice & Seasoning Brands / McCormick / McCormick Grill Mates Vegetable Seasoning 20 oz. Home / Spices & Seasonings / Spice & Seasoning Brands / McCormick / McCormick Grill Mates Vegetable Seasoning 20 oz. Home / Pantry Items / Baking & Cooking / Spices & Seasonings / Spice & Seasoning Brands / McCormick / McCormick Grill Mates Vegetable Seasoning 20 oz. Home / Specialty Grocery / Baking & Cooking / Spices & Seasonings / Spice & Seasoning Brands / McCormick / McCormick Grill Mates Vegetable Seasoning 20 oz. Home / Specialty Grocery / Spices & Seasonings / Spice & Seasoning Brands / McCormick / McCormick Grill Mates Vegetable Seasoning 20 oz. Home / Hot GIFT Ideas / Gifts For Him / Party Favorites / Spices, Seasonings, Rubs & Liquid Smoke / BBQ Rubs & Seasonings / McCormick Grill Mates Vegetable Seasoning 20 oz. Home / Pantry Items / Condiments, Sauces, Dressings, & More / Spices, Seasonings, Rubs & Liquid Smoke / BBQ Rubs & Seasonings / McCormick Grill Mates Vegetable Seasoning 20 oz. Home / New England Classics / Condiments, Sauces, Dressings, & More / Spices, Seasonings, Rubs & Liquid Smoke / BBQ Rubs & Seasonings / McCormick Grill Mates Vegetable Seasoning 20 oz. Home / Hot GIFT Ideas / Gifts For Him / Party Favorites / Condiments, Sauces, Dressings, & More / Spices, Seasonings, Rubs & Liquid Smoke / BBQ Rubs & Seasonings / McCormick Grill Mates Vegetable Seasoning 20 oz. Home / BBQ & Grilling / Condiments, Sauces, Dressings, & More / Spices, Seasonings, Rubs & Liquid Smoke / BBQ Rubs & Seasonings / McCormick Grill Mates Vegetable Seasoning 20 oz. Home / Hot GIFT Ideas / BBQ & Grilling / Condiments, Sauces, Dressings, & More / Spices, Seasonings, Rubs & Liquid Smoke / BBQ Rubs & Seasonings / McCormick Grill Mates Vegetable Seasoning 20 oz. Home / Hot GIFT Ideas / Gifts For Him / Party Favorites / BBQ & Grilling / Condiments, Sauces, Dressings, & More / Spices, Seasonings, Rubs & Liquid Smoke / BBQ Rubs & Seasonings / McCormick Grill Mates Vegetable Seasoning 20 oz. Home / Specialty Grocery / Condiments, Sauces, Dressings, & More / Spices, Seasonings, Rubs & Liquid Smoke / BBQ Rubs & Seasonings / McCormick Grill Mates Vegetable Seasoning 20 oz. Home / Foods of New England / Condiments, Sauces, Dressings, & More / Spices, Seasonings, Rubs & Liquid Smoke / BBQ Rubs & Seasonings / McCormick Grill Mates Vegetable Seasoning 20 oz. Home / BBQ & Grilling / Spices, Seasonings, Rubs & Liquid Smoke / BBQ Rubs & Seasonings / McCormick Grill Mates Vegetable Seasoning 20 oz. Home / Hot GIFT Ideas / BBQ & Grilling / Spices, Seasonings, Rubs & Liquid Smoke / BBQ Rubs & Seasonings / McCormick Grill Mates Vegetable Seasoning 20 oz. Home / Hot GIFT Ideas / Gifts For Him / Party Favorites / BBQ & Grilling / Spices, Seasonings, Rubs & Liquid Smoke / BBQ Rubs & Seasonings / McCormick Grill Mates Vegetable Seasoning 20 oz. Home / Pantry Items / Spices & Seasonings / BBQ Rubs & Seasonings / McCormick Grill Mates Vegetable Seasoning 20 oz. Home / New England Classics / Spices & Seasonings / BBQ Rubs & Seasonings / McCormick Grill Mates Vegetable Seasoning 20 oz. Home / Foods of New England / Spices & Seasonings / BBQ Rubs & Seasonings / McCormick Grill Mates Vegetable Seasoning 20 oz. Home / Spices & Seasonings / BBQ Rubs & Seasonings / McCormick Grill Mates Vegetable Seasoning 20 oz. Home / Pantry Items / Baking & Cooking / Spices & Seasonings / BBQ Rubs & Seasonings / McCormick Grill Mates Vegetable Seasoning 20 oz. Home / Specialty Grocery / Baking & Cooking / Spices & Seasonings / BBQ Rubs & Seasonings / McCormick Grill Mates Vegetable Seasoning 20 oz. Home / Specialty Grocery / Spices & Seasonings / BBQ Rubs & Seasonings / McCormick Grill Mates Vegetable Seasoning 20 oz. Home / New / McCormick Grill Mates Vegetable Seasoning 20 oz. Home / Hot GIFT Ideas / Gifts For Him / Party Favorites / Spices, Seasonings, Rubs & Liquid Smoke / Seasonings & Rubs / McCormick Grill Mates Vegetable Seasoning 20 oz. Home / Pantry Items / Condiments, Sauces, Dressings, & More / Spices, Seasonings, Rubs & Liquid Smoke / Seasonings & Rubs / McCormick Grill Mates Vegetable Seasoning 20 oz. Home / New England Classics / Condiments, Sauces, Dressings, & More / Spices, Seasonings, Rubs & Liquid Smoke / Seasonings & Rubs / McCormick Grill Mates Vegetable Seasoning 20 oz. Home / Hot GIFT Ideas / Gifts For Him / Party Favorites / Condiments, Sauces, Dressings, & More / Spices, Seasonings, Rubs & Liquid Smoke / Seasonings & Rubs / McCormick Grill Mates Vegetable Seasoning 20 oz. Home / BBQ & Grilling / Condiments, Sauces, Dressings, & More / Spices, Seasonings, Rubs & Liquid Smoke / Seasonings & Rubs / McCormick Grill Mates Vegetable Seasoning 20 oz. Home / Hot GIFT Ideas / BBQ & Grilling / Condiments, Sauces, Dressings, & More / Spices, Seasonings, Rubs & Liquid Smoke / Seasonings & Rubs / McCormick Grill Mates Vegetable Seasoning 20 oz. Home / Hot GIFT Ideas / Gifts For Him / Party Favorites / BBQ & Grilling / Condiments, Sauces, Dressings, & More / Spices, Seasonings, Rubs & Liquid Smoke / Seasonings & Rubs / McCormick Grill Mates Vegetable Seasoning 20 oz. Home / Specialty Grocery / Condiments, Sauces, Dressings, & More / Spices, Seasonings, Rubs & Liquid Smoke / Seasonings & Rubs / McCormick Grill Mates Vegetable Seasoning 20 oz. Home / Foods of New England / Condiments, Sauces, Dressings, & More / Spices, Seasonings, Rubs & Liquid Smoke / Seasonings & Rubs / McCormick Grill Mates Vegetable Seasoning 20 oz. Home / BBQ & Grilling / Spices, Seasonings, Rubs & Liquid Smoke / Seasonings & Rubs / McCormick Grill Mates Vegetable Seasoning 20 oz. Home / Hot GIFT Ideas / BBQ & Grilling / Spices, Seasonings, Rubs & Liquid Smoke / Seasonings & Rubs / McCormick Grill Mates Vegetable Seasoning 20 oz. Home / Hot GIFT Ideas / Gifts For Him / Party Favorites / BBQ & Grilling / Spices, Seasonings, Rubs & Liquid Smoke / Seasonings & Rubs / McCormick Grill Mates Vegetable Seasoning 20 oz. Home / Pantry Items / Spices & Seasonings / Seasonings & Rubs / McCormick Grill Mates Vegetable Seasoning 20 oz. Home / New England Classics / Spices & Seasonings / Seasonings & Rubs / McCormick Grill Mates Vegetable Seasoning 20 oz. Home / Foods of New England / Spices & Seasonings / Seasonings & Rubs / McCormick Grill Mates Vegetable Seasoning 20 oz. 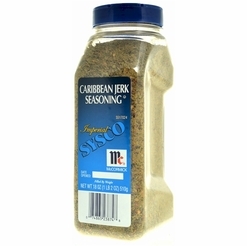 Home / Spices & Seasonings / Seasonings & Rubs / McCormick Grill Mates Vegetable Seasoning 20 oz. Home / Pantry Items / Baking & Cooking / Spices & Seasonings / Seasonings & Rubs / McCormick Grill Mates Vegetable Seasoning 20 oz. Home / Specialty Grocery / Baking & Cooking / Spices & Seasonings / Seasonings & Rubs / McCormick Grill Mates Vegetable Seasoning 20 oz. Home / Specialty Grocery / Spices & Seasonings / Seasonings & Rubs / McCormick Grill Mates Vegetable Seasoning 20 oz. McCormick Grill Mates Vegetable Seasoning is a veritable potpourri of spices, herbs and vegetables including onions, tomatoes, garlic, red bell peppers, sun-dried tomatoes, leeks and chives, that enhances the naturally delicious flavor of vegetables and vegetable dishes. Ingredients: DEHYDRATED VEGETABLES (ONION, GARLIC, RED BELL PEPPERS, SUNDRIED TOMATO, GREEN ONION), SALT, SUGAR, SPICES AND HERBS, MALTODEXTRIN, MODIFIED CORN STARCH, SOYBEAN OIL, WORCESTERSHIRE POWDER (MOLASSES, VINEGAR, CORN SYRUP, SALT, CARAMEL COLOR, GARLIC, SUGAR, SPICES, TAMARIND, NATURAL FLAVOR, SULFITING AGENTS), VINEGAR, DISODIUM GUANYLATE, DISODIUM INOSINATE (FLAVOR ENHANCERS), NATURAL FLAVORS, ASCORBIC ACID, TURMERIC, AND SULFITING AGENTS. 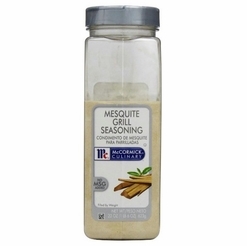 McCormick Mesquite Grill Seasoning 22 oz. 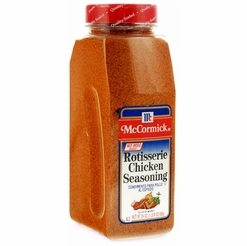 McCormick Rotisserie Chicken Seasoning 24 oz. 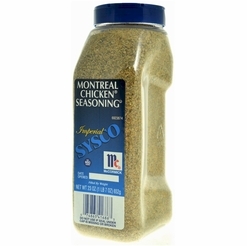 McCormick Montreal Chicken Seasoning 23 oz. 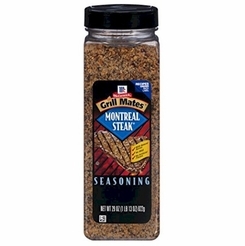 McCormick Grill Mates Montreal Steak Seasoning 29 oz.